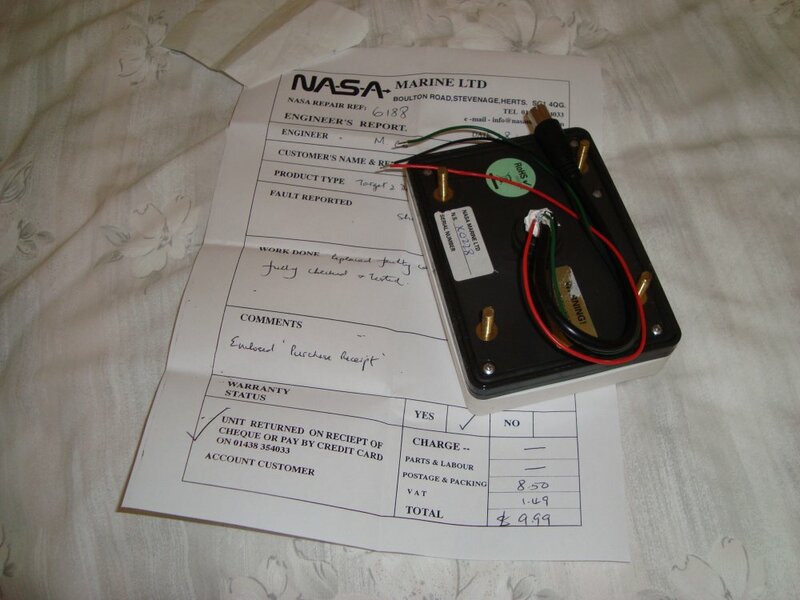 Following my previous posting about my faulty NASA Target 2 Depth Sounder, I’m pleased to say NASA Marine carried out the repair and returned the unit to me on Thursday, 29th April, which was very good, because they did the repair right away. 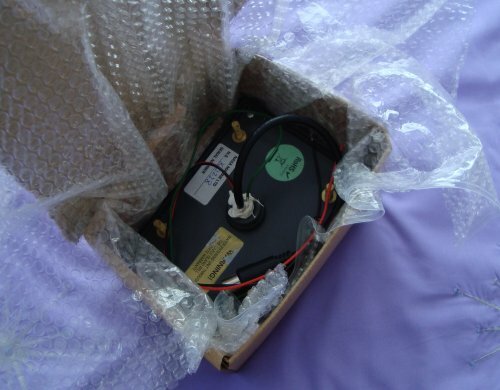 I have yet to reinstall the Sounder and test it, but the paperwork from NASA confirms that a faulty capacitor was replaced and that the Sounder was fully tested before being despatched. When I first started coastal sailing I relied upon an old-fashioned lead - line. 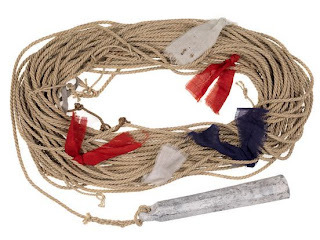 Mine used to reach a depth of 7 fathoms and was marked traditionally with 2 strips of leather for 2 fathoms, 3 strips for 3 fathoms, a piece of white cloth for 5 fathoms and a piece of red cloth for 7 fathoms. Soundings by a lead-line can go as deep as 20 fathoms (120 feet). At 10 fathoms there’s a piece of leather with a hole in it; at 13 fathoms there’s a piece of blue cloth, 15 fathoms is marked with white cloth, 17 fathoms with red cloth, and at 20 fathoms there’s as piece of string with two knots. All of these markers can be identified by touch, so that the lead-line can be used at night. At the base of the cylindrical lead sinker there’s a cavity for inserting tallow which can be used to sample the nature of the sea bed. Gravel, pebbles, sand or mud adhere to the sticky tallow. The physical aspect of the sea bed can be an aid to identifying where the vessel is – that’s if the navigator’s chart is marked with the appropriate symbols. The old-fashioned Admiralty charts were very good in this respect. More modern metric charts have less information about the nature of the sea bed. I’m a convert to digital depth sounders because a far better understanding of the form of the sea bed can be obtained through their use than by a simple lead-line, and electronic sounders have the advantage of providing multiple instantaneous readings. On the other hand, a lead-line gives an absolute depth without the possibility of error, because the leadsman has a physical connection between him and the sea bed. He can actually feel when the lead is stuck in mud, or when it strikes rock, or when it comes up cleanly from a sandy bottom. More advanced electronic depth sounders can take readings of the contour of the ground forward of where the ship is heading; therefore they can warn of shallow water ahead by activating an audible alarm. Even simple, inexpensive electronic sounders such as my NASA Target 2 may have a facility for presetting depth warnings, both for shallow and deep water. On Friday, 27th November 2009 I posted an article* with the title, ‘Bounty Launch’. It was about Captain William Bligh’s 3,618 mile voyage after he and a crew of 18 were set adrift in a ship’s launch. This was a remarkable feat of endurance and seamanship under extreme conditions of survival. Films have been made about the Mutiny on the ‘Bounty’ when Fletcher Christian assumed control of the ‘Bounty’. The voyage started near the island of Tofua in the Tongan archipelago and ended at the Dutch colony of Timor. Don McIntyre and his crew of three are attempting to re-enact the voyage, but with less crew aboard his open ‘Talisker Bounty Boat’. 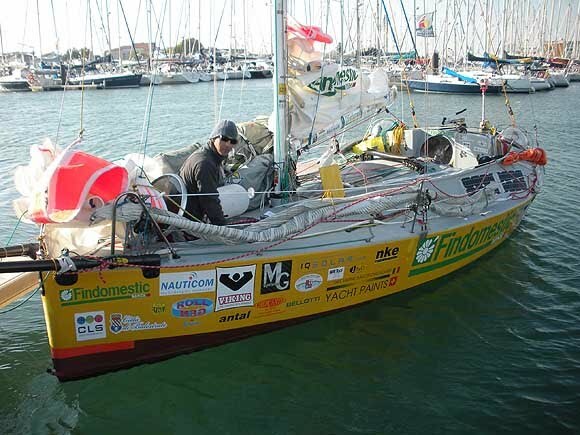 Originally, Mike Perham, the young English sailor who holds the record for being the youngest person to sail around the world on his own, was to crew for Don, but he has had to withdraw at a very late stage because of suffering from appendicitis. An 18 year old complete novice sailor, Chris Wilde from Warwick has stepped in to take his place. The other crew members are 48 year old David Wilkinson and Stuart Kershaw. McIntyre had intended equipping his crew with Gor-tex jackets, but he has now elected not to do so, presumably because the spirit of replicating Bligh’s voyage will have been made void. Instead he has tried to be as faithful as possible by having aboard similar items and food to those on the original ship’s launch of the ‘Bounty’, including an 18th century octant and sextant, two 18th century pocket watches, nautical tables, a ship’s compass, telescope, rope knot meter, lead line, ink, pens, notebooks, a logbook and a magnifying glass. The valiant sailors started their voyage on 29th April, 221 years after Bligh was cast adrift. Their first objective was to sail or row to Tofua to collect water and food before continuing in the wake of the original Bounty boat. You can follow their Blog by going to the first link below. They will need good fortune and the grace of God to succeed. There is virtually no information on the Web about the Yachting World People’s Boat. I believe she was conceived back in the post-war years in response to a competition run by the Yachting World Magazine. Who designed her I do not know, but I can remember seeing a few of these wooden yachts that had been built by amateurs. I think they had a LOA of roughly 22’ and a beam of around 6.5’ and a draught of 3’. They had a low profile cabin and a moderately sized cockpit which was not self-draining. I believe one Yachting World People’s Boat did a circumnavigation from west to east via the Mediterranean through the Suez Canal, but all this is from a hazy memory. 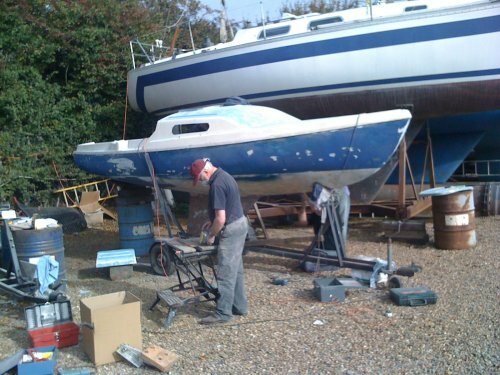 Recently I was passing along the waterfront at the Hullbridge Yacht Club when I saw an attractive double-ended wooden boat being painted and prepared for the water. Her owner told me he had started caring for her after his uncle had been forced to give up sailing. His uncle had designed and built the yacht which was based on the lines of a Yachting World People’s Boat. She was much lager than the original boat, but instead of a transom she had a canoe stern. Her underwater profile, with a single chine and a ‘v’ bottom with a long straight keel, was very similar to the original People’s Boat. I can remember first seeing this unique yacht in 1973 at her Hullbridge mooring which was too shallow for her to remain afloat at low water. 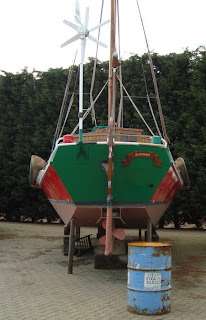 This meant she has always had to have legs fitted to keep her upright when her keel settles on the river bed. She is normally moored fore and aft with her bow pointing up river to prevent her from swinging out of position. Traditionally yachts which are moored fore and aft have their bow facing upstream, because the ebb flows faster than the flood, and in the case of this particular boat, her bow points towards the prevailing westerly wind. She is rigged as a high aspect ratio Bermudan sloop, and with her deep long keel which is well ballasted with iron, I feel sure her performance to windward must be very good. I like her built-up doghouse which gives standing headroom where the deadrise kicks up towards her stern. I also like her tabernacle which makes raising the mast an easy procedure. The well maintained woodwork, after all these years, is a credit to her owner. Built from plywood, she remains in excellent condition. Other touches are her generous side decks, pushpit and pulpit, and note the hawse at the bow for mooring lines. She has a substantial bow roller to take the forces of the anchor chain. The mahogany rubbing strip below the gunwale gives a bit of class, besides being a practical means of protecting the topsides when the yacht is moored alongside another yacht or to a quay. The raised fore hatch and opening lights on the cabin trunk can provide ample ventilation when the yacht is at anchor or in port. All in all, this special yacht is a delight for her owner who cares for her as if she is his soulmate. There are many other factors that excite me about yachts, such as their rigs, keel configurations, hull shapes and their design for specific purposes. Are they for racing, cruising or a combination of the two? Are they required for ocean crossings, coastal cruising or for just pottering around muddy creeks? Are they for private family use, single-handed sailing, or commercial projects such as for sailing schools, charter companies, luxury cruising or for extreme expeditions? The end result of the design depends on the purpose for which the yacht is required. The variables are numerous, and I haven’t mentioned multihulls, such as trimarans, catamarans and proas. The above photograph taken at Hullbridge looking northwards across the River Crouch to South Woodham Ferres Yacht Club shows eight different yachts, all but one of them built of GRP. The group of three yachts on the left are from the closest to the furthest, an Etap 22, a Wing 25, and a Sunray 21. The boat in the middle on the far bank is a wooden Blackwater sloop, and the nearest yacht of the group to the right is an Elizabethan 23; behind her is a Westerly Griffon 26. I am not sure of the class names of the remaining two yachts, but the one with the dark blue hull may be a version of the Snapdragon range. Do yachts excite you as they do me? On Saturday, 24th April I mentioned in my Blog that the NASA Target 2 Depth Sounder aboard ‘Ladybird’ was not working properly. I tried replacing the olive oil in the transducer reservoir, but that had no effect. I subsequently went online to find forums about faulty readouts, and I asked readers of this Blog if they knew how I could get the Sounder working correctly. There was nothing in the NASA Marine website to indicate what was wrong when the display showed the word ‘OUT’. This morning I phoned NASA Marine and told them what was wrong. I was advised to put my ear to the transducer when the Depth Sounder was turned on, and if I heard clicking sounds, the transducer was most likely working correctly. I was also told to rub my fingers on the base of the transducer to see if that caused random readings on the display, but there were none; in which case I was advised to send the unit back to NASA Marine. 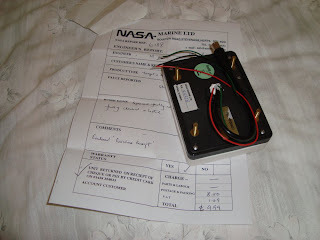 I unscrewed the Depth Sounder from the cabin bulkhead and took it home for packing before being sent to NASA Marine. 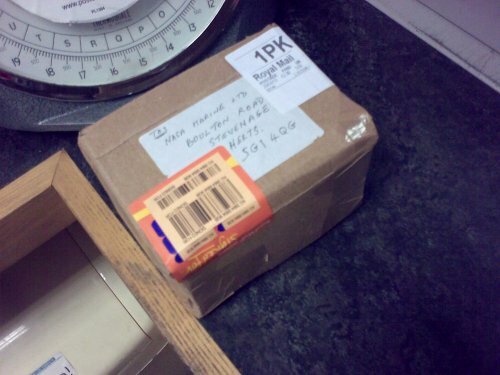 Royal Mail, first-class, signed-for postage was £2.98, but the package missed the last collection of the day from my local Post Office when it was posted at 15.12. Therefore NASA Marine could not possibly receive the package until Wednesday morning the 28th April at the earliest. I’ll be interested to know how long they will take to deal with the problem. The guarantee was in date for a replacement unit. I’ll let my readers know when I receive a response from NASA either by phone, letter, or by email or when a parcel with a replacement unit arrives at my home. Let me say, I was entirely satisfied with the performance of the Target 2 Depth Sounder while ‘Ladybird’ was in commission last year. I wonder what could possibly have made the unit malfunction when it was stored under cover during the winter months. Last winter was the coldest for many years, so perhaps that may have affected the electronics; although I doubt so, because the unit was sealed and kept dry. 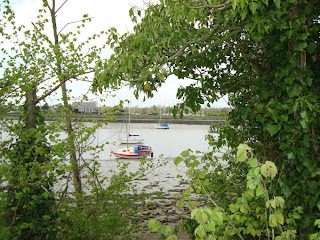 I moved to Essex in 1972, and since then I have enjoyed walking the banks of the River Crouch. 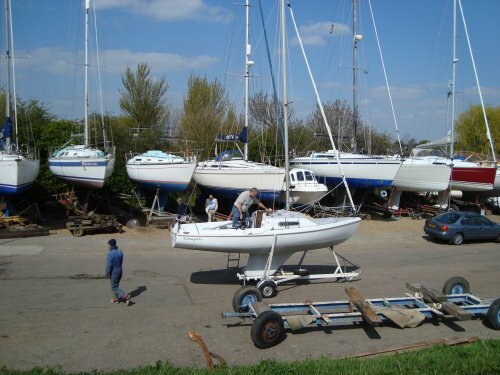 At Hullbridge I see the same yachts year after year appearing at the beginning of the sailing season after their winter hibernation. 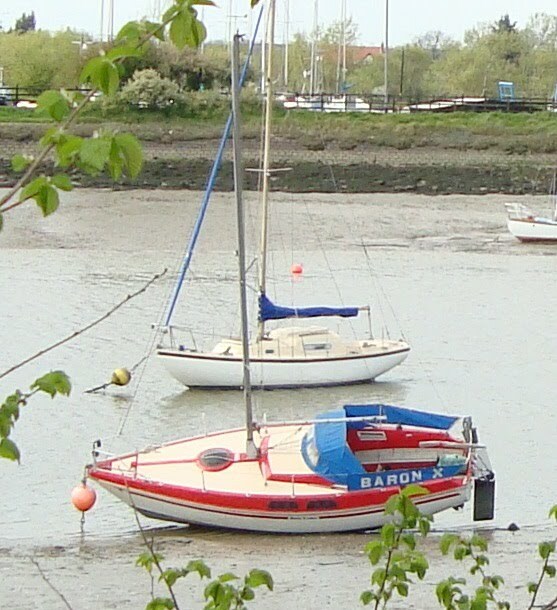 One such yacht is the red and white Etap 22 seen in the foreground in the above photo. Her name is ‘Baron X’, and to my mind this is quite inappropriate because she should be a baroness! I knew one of her previous owners for whom I crewed on a couple of occasions. Under certain conditions she would leave the racing fleet behind, but on others she would lag behind – something to do with ‘sailing in the groove’. You know when a boat is performing well; she goes straight as a die while her helm is almost in neutral, meaning the boat is in perfect balance. This can be on any point of sailing, but it is especially satisfying when the yacht is sailing to windward. The sail acts as a bird’s wing providing lift, while the vessel is drawn forwards with minimal leeway as her keel effortlessly cleaves the dense deep water below her shapely hull. 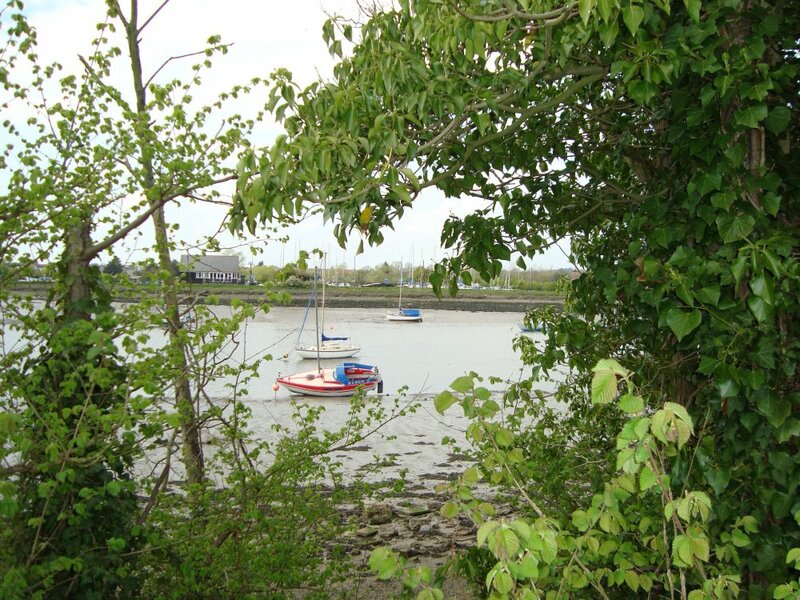 Well, this afternoon I walked the riverbank at Hullbridge and memories flooded back of good times I had sailing along this stretch of the River Crouch. I couldn’t resist taking a photo of the red and white yacht. The Etap 22 was designed by E.G. Van de Stadt. This unsinkable, lifting keel trailer sailer was produced in the 1970’s. She was unsinkable because closed-cell polyurethane foam filled the cavity between her inner and outer hull. There were certain priorities today, and sailing wasn’t one of them, but I was able to find time for trying to sort out the NASA Target 2 depth sounder and for rewiring the GPS units with shorter lengths of wire from the ship’s battery. I had a few hours out on the boat while I attended to these things, besides having lunch and watching the juniors from the Royal Corinthian Yacht Club racing their Optimist, Lazer and RS dinghies. Altogether I had a pleasant time afloat while the sun shone and the wind was quite light from the east. Despite a thorough examination of the depth sounder, including the transducer and the cable, I was unable to rectify the fault. I tested the transducer by placing it directly in the water, but the readings were the same as if the cable had not been connected. The first readout after turning on the power supply showed a ‘U’ over a ‘dash’ and ‘0.0 metres’. Almost immediately this was followed by the word ‘out’. I can only assume the sensors of the depth sounder recorded that the transducer was out of the water. I checked to see if this was the case, but the internal transducer was mounted correctly in a bath of olive oil sealed to the inside of the hull below the waterline, and not far from the bow. This arrangement worked perfectly well last year. Nevertheless, I refilled the reservoir with new oil, which made no difference. The Installation and User Instructions Manual for the Target 2 does not mention anything about the symbols I’ve described. I’ve looked at a couple of Internet Forums where the Target 2 has been the topic, but I cannot find a reference to the fault happening with mine. If there is anyone reading this who knows how I can make my depth sounder work again, please contact me via the comments facility of the Blog. I can manage without an echo sounder; however, having one gives me reassurance when I’m sailing in shallow waters. My Lowrance GPS and Garmin Etrex GPS provide accurate readouts as to where the yacht is, but the extra input of the exact depth of water via the Target 2 is very helpful when I’m navigating in restricted waterways. If you read my Blog* about the Hunter 19 ‘Barangoola’ you will note that I was concerned that her cockpit hadn’t been bailed out. I was fearful that rainwater would accumulate and overflow into her cabin, but I was relieved to recently discover that this special little boat which had been won at this year’s London Boat Show, was being cared for by her new owner. Both ‘Ladybird’ and ‘Barangoola’ were launched the same day; therefore I had the pleasure of meeting the boat’s new captain. He is a very experienced sea canoeist who understands the sea, the tides, and the effect of winds upon the water, which knowledge is essential for the coastal sailor. There will be a learning curve as he is taught to sail the boat with his sons. I hope that we may meet again, so that I can hear how they get on. I’ll be interested to find out if they want to day sail the boat, race her or perhaps take her on short cruises. The new skipper told me he will be having a boom tent made to prevent rainwater from entering the cockpit, and it could be used to extend the living accommodation. Well, we made it out on the water for the first sail of the season. Everything was just right. 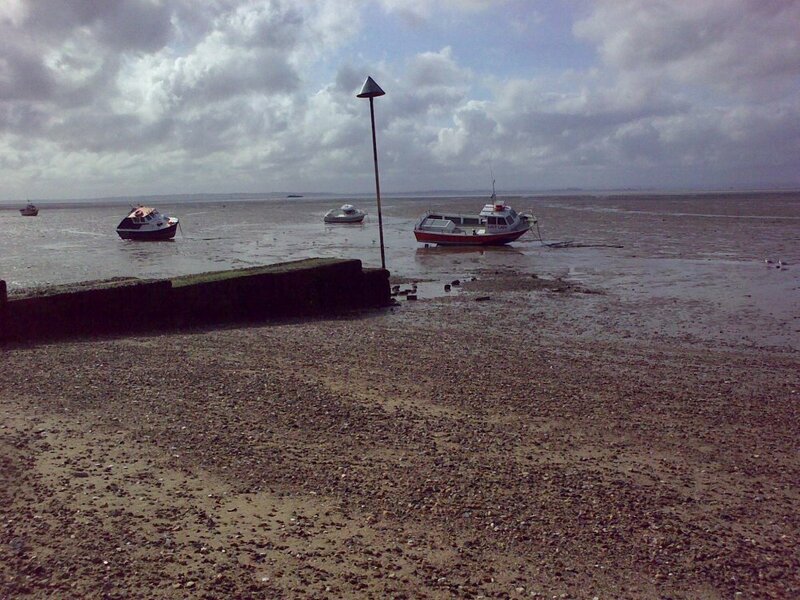 There was a gentle wind from the east, and the floodtide was making into the River Crouch. 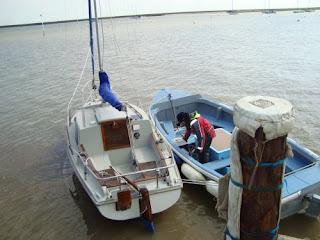 After preparing ‘Ladybird’ for sailing, I started the Honda outboard and headed the yacht into the wind. When we were a short way beyond the entrance of the River Roach I hoisted sail and tacked to windward. 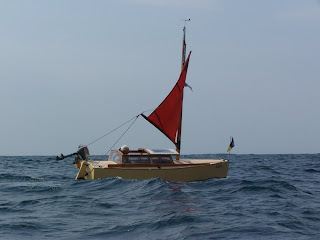 At first there was barely enough wind for the boat to make over the tide, but it freshened a little and veered to the southeast which meant we could sail at 2.9 knots over the ground. Only a few yachts were out and about; therefore I had the River almost to myself, except for a small trawler that was operating close to the north shore in shallow water. Later as the tide rose, she made her way into the River Roach. Anchored near the Inner Crouch Buoy there was a smart looking motor vessel which I discovered was the safety vessel for the Maplin Firing Range. I continued sailing as far as the Crouch Buoy; then I brought ‘Ladybird’ round for a run back up the River. Our speed shot up to 4.9 knots. The Autohelm easily managed the downwind sailing, and within an hour we returned to our mooring, covering the same distance we had to windward in two hours. 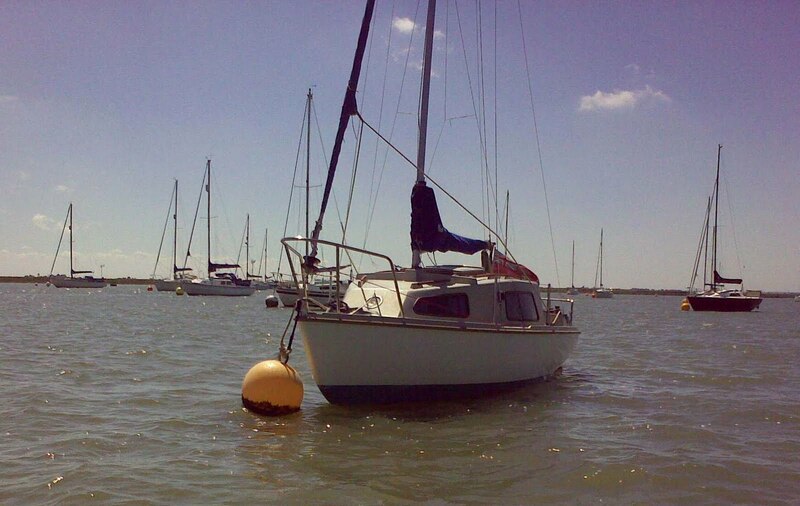 This first sail of the season had shown that all was working well, except the depth sounder. I was very pleased with the Honda 2.3 four stroke outboard which gave ample thrust at only half throttle. I like the fact that oil does not need to be mixed with the fuel (petrol) and that the engine is air cooled. It is also fairly quiet, as the exhaust fumes exit under the water, not that there are any noticeable fumes. My previous Honda 2.3 had given me good service; hence my choice for another one. Botters, boiers and hoogaars are traditional shallow draught Dutch sailing vessels, perhaps 60’ in length, with a draught of under 3’. 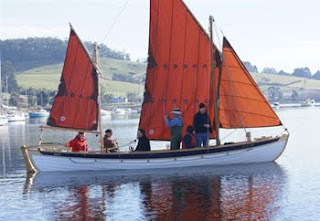 All of them have bluff bows, but boiers have rounded topsides and bottoms; botters have rounded topsides and flat bottoms meeting at a chine, and hoogaars generally have flat sections on the sides and bottom. Smaller pleasure yacht versions of these types are not uncommon in Holland and some of the more modern steel ones following the lines of hoogaars are not unlike dories. All of these boats carry leeboards which are usually made of wood and the less rounded ones have hollow section to provide lift to windward when they are deployed on the leeward side of the vessel. Yesterday while walking along the riverside I was attracted to a steel hoogaar type yacht on the hard at Burnham-on-Crouch Yacht Marina. I liked the simplicity of her design. She had uncomplicated straight sides and a flat, rockered bottom joined at a single chine. Perhaps she was not beautiful, but she was so different to the normal fibreglass round bilge yachts at the marina, that I just had to have a closer look. The launching actually took place as planned at 1500. 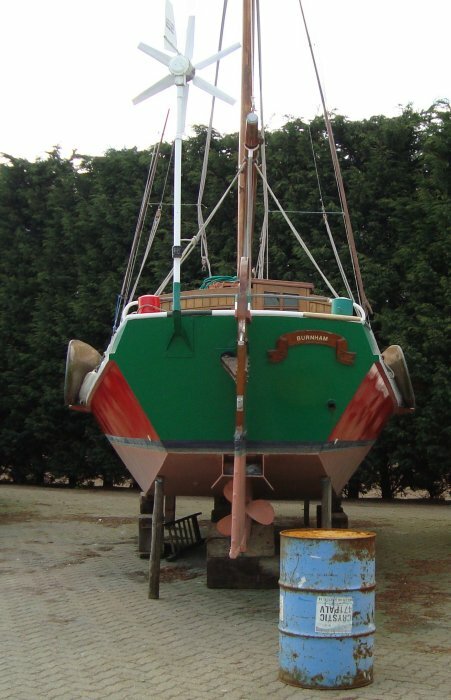 There was enough water for ‘Ladybird’ to float without scraping off the freshly applied antifouling to the base of her keels. As soon as she was lifted off her chocks by the crane I touched up the spots that could not be accessed during the main session of antifouling. She looked smart and I was pleased with her. The boatyard crew did a good job, even attaching the backstays with a little tension, before she was shunted away to her temporary mooring. I’m told she will be placed on a mooring closer to the pontoon, as she was last year. I rowed out to the yacht for checking that all was well. As expected, there were no leaks and everything was in order, except the depth sounder which will need resetting. She’s ready for her first sail of the season. My theme is similar to yesterday’s topic, i.e., I’m looking forward to things to come. Today did not disappoint, although ‘Ladybird’ was not launched, but I guessed that could happen. 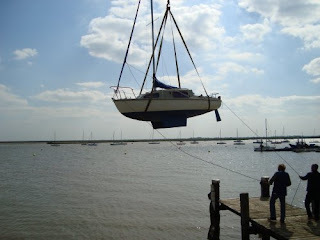 At this time of year many boats are ready for the water, and the boatyard has one crane, but I’ve been given a promise for the boat to be launched tomorrow, at 1500. The tide will be high enough for ‘Ladybird’ to float clear of the mud so that she can be taken to her mooring. This morning I tested the navigation lights and I found the starboard one was not working, but after I cleaned the contact points it was OK. Because I very seldom use the fixed hand basin I decided to block off the basin’s seacock by inserting a plug into the drain where it exits underneath the hull. The basin is difficult to clean and because it is under the companionway, dust and dirt accumulates there. The basin is not user-friendly because I have to lean forward and stretch out my arms to reach anything. I much prefer a portable bowl which I place on my lap or on the lower step within reach when I’m sat on the starboard bunk. Getting rid of water from the bowl is done by emptying the contents over the side of the boat. The procedure does not look pretty, but the result is the same as if the contents were to go down the drain. This morning I repaired a few minor cracks at the chines of my yacht tender. This should make her watertight; I hope so, because last season water found its way into the dinghy. One of my visitors got his feet wet. 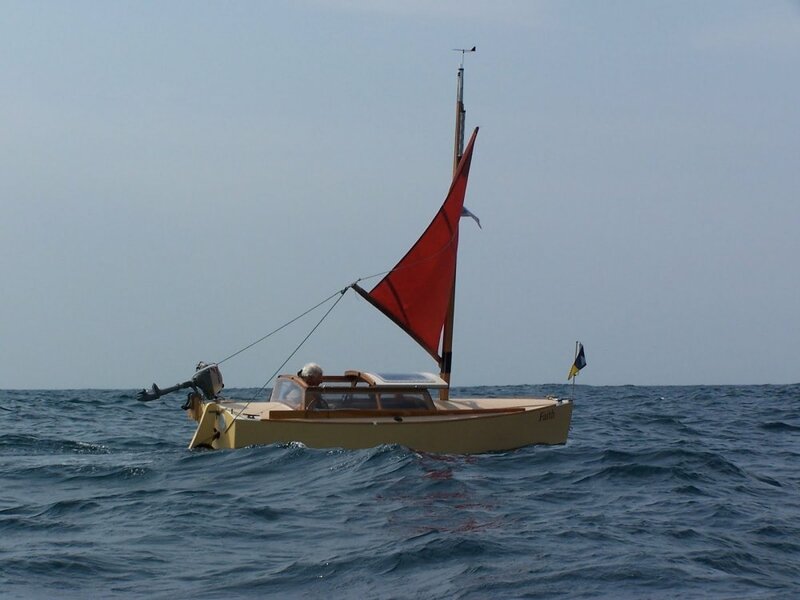 My tender is a Seahopper folding dinghy, except she no longer folds. I bought her in 1984, and apart from a short period I’ve owned her ever since. She temporarily belonged to a friend, who bought one of my boats, and the Seahopper was part of the deal, but I bought her back. As she began to leak in her twenty-second year I made her into a rigid dinghy by glassing her chines. She’ll probably provide a service for two or three years before she disintegrates. Well, the prospect looks good for an enjoyable season. 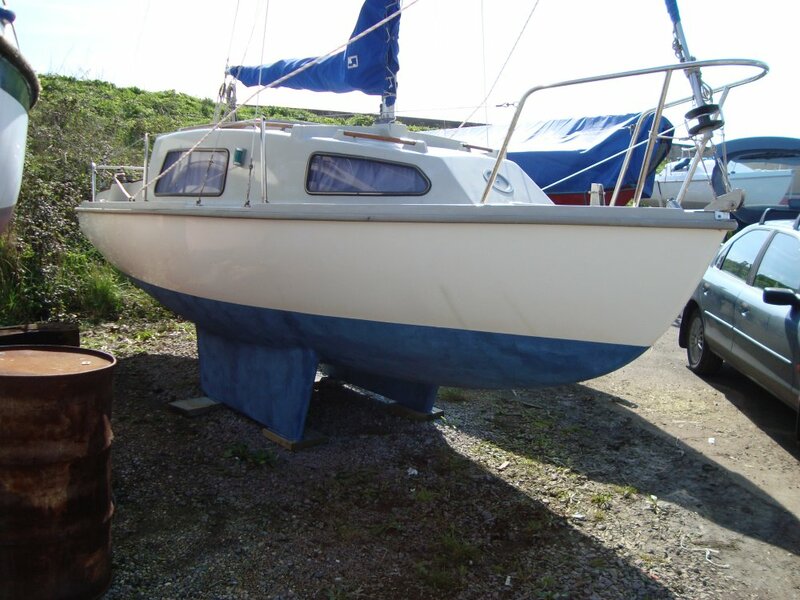 Hopefully, I’ll be out on the water soon for the first sail. 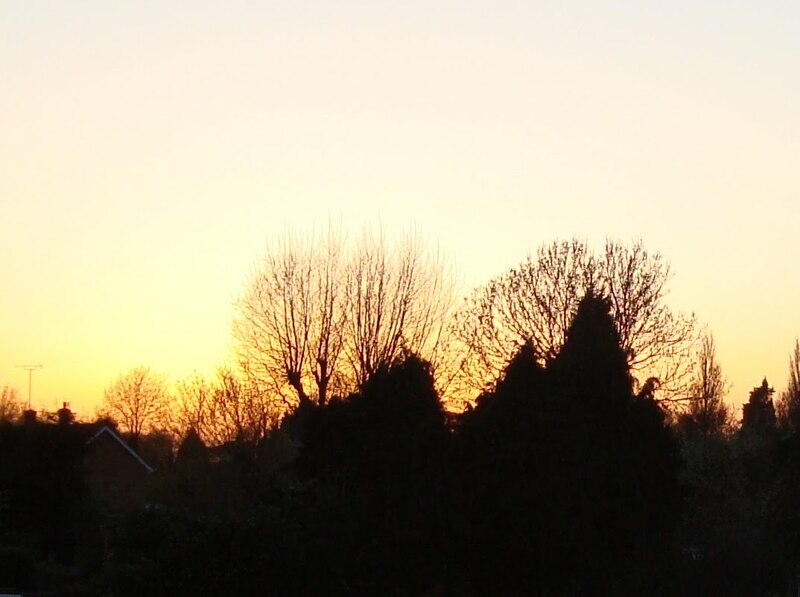 If you are a bit like me your day will start early, just as the sun rises. You’ll know when the day begins because you’ll feel an increase in the temperature of your body as a surge of blood is pumped through your veins. You’ll feel the blood coursing through your veins and you’ll want to be out of bed, on your feet, looking forward to what the day may bring. Looking forward is always more positive than looking back, and besides, you can see where you are going! 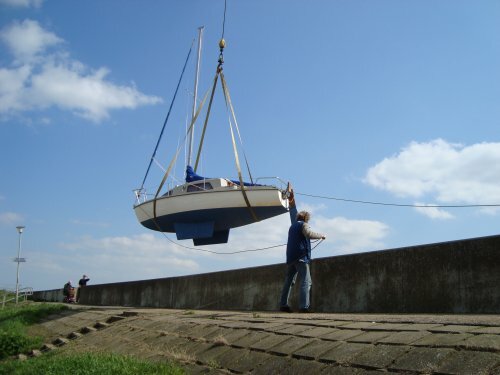 I’m looking forward to many things, and tomorrow my boat may be launched, which is an exciting prospect. What adventures may lay in store as she and I set off on our summer cruise? The other day I was ambling along the beach at Southend. There was a fresh northerly wind; the clouds were skipping across the sky. I paused to take in the scene. Across the Thames I could see the Isle of Sheppey, and to the right there was a faint dip in the horizon which marked the entrance to the Medway at Sheerness. The air was good and fresh. 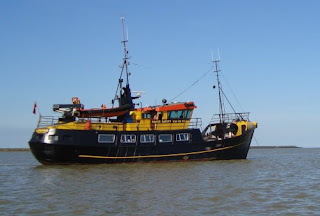 My heart beat faster as I thought of ‘Ladybird’ and me starting our big adventure at the beginning of June; then a day or perhaps two after the start of our summer cruise she and I could be putting into the River Swale to the east of Sheppey. Our adventure will have begun. Will I be up to it? Will I be strong enough? Will I have lost my touch? Nothing is for sure, as my daughter who is stranded in Italy just now will testify. Her plane has been grounded, because of volcanic dust affecting the atmosphere from an Icelandic erupting volcano. This is an act of nature, or of God, according to your beliefs. How will things pan out? From where will the winds blow? Will they be strong or light and will there be rain? For the sailor, the direction and strength of the wind is of paramount importance. There’s always a challenge for the coastal sailor because of the proximity of land and the frequency of traffic, i.e, other boats, and for the single-handed coastal sailor, fatigue is to be avoided. I’ll be looking forward to updating this Blog with a daily record of ‘our’ progress or lack of it, but as on previous occasions I may not be able to upload the story as it unfolds until I can gain access to WIFI points. I hope you will be looking forward to reading my log as I am to sharing it with you. The weather was fantastic today. First thing this morning I loaded the car with bits and pieces to take to the boat. There was a wispy mist around the garden, but the sun soon broke through. On arrival at Burnham I tied the ladder to the mast and rove a new port hand flag halyard. While I was up the ladder I straightened the crosstrees and fixed their ends to the shrouds to prevent them from drooping. 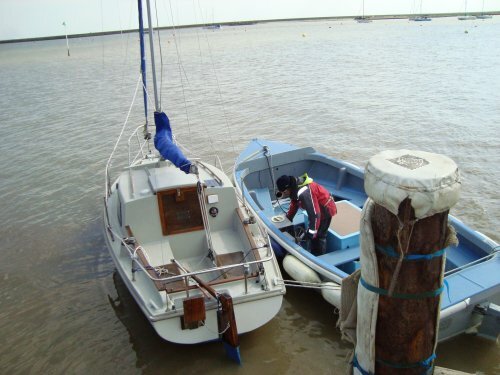 I shipped the rudder, fitted the tiller and set up a bungee to keep the rudder from lifting in a seaway. Next, I shackled the plough anchor to the chain and secured it with ties; then I tried the new mounting for the GPS which worked a treat. After checking the battery acid, I cleaned the topsides. Back at home after lunch I cut the lawns, and trimmed the hedge. Very unusually, there were no aeroplane trails in the sky because all passenger flights over the UK have been grounded. For the past three days there have been no jet planes overhead because of volcanic ash drifting high in the atmosphere. The culprit is an erupting volcano in Iceland. Minute particles of volcanic dust can clog jet engines, causing them to stop; hence the closure of UK air space. A few small propeller driven aircraft have flown overhead; one was particularly interesting because it looked as if it had been made by enthusiasts. The plane was like a power-assisted glider with almost transparent wings which revealed their framework. My wife told me that most of the digital TV channels were not working and I wondered if the volcanic dust was the cause, or whether it was just the effect of the high pressure system. The area where I live does not have good digital reception, because the local broadcasting aerials have not been upgraded. I thought the dust may bring about a superb sunset, but that was not the case. I watched the sun go down and held my breath, but I didn’t see a green flash or an array of gorgeous colours. On the 31st March, 2010 I published an article about Greg Kolodziejzyk and his pedal-driven vessel, ‘Within’. My theme was centred on his preparation for his proposed ocean crossing from Vancouver to Hawaii. I praised him for his thorough preparation, but I was premature in my assessment. He had only conducted preliminary trials of his unique canoe-like boat. 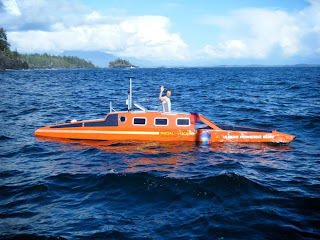 When he recently ventured to sea at Ucluelet he became alarmed because his vessel would not respond to her rudder as she was heeled by the wind which was a steady 25 knots. ‘Within’ lay beam on to the seas, and despite Greg’s effort at thrusting the pedals to turn the prop at maximum speed, it had little effect, because the prop was near the surface of the water. Without forward momentum, the rudder was of no use. Being a very open and honest man, he immediately published an article on his website explaining his concern and disappointment. He sought help to solve the problem, and people responded with ideas. The designer of the boat, Rick Willoughby, believes a larger rudder, more ballast in the stern, and a system for transferring ballast to the windward side will deal with the shortcomings. He proposes to install a transverse track for mounting the batteries, so that they can be used as the windward ballast. 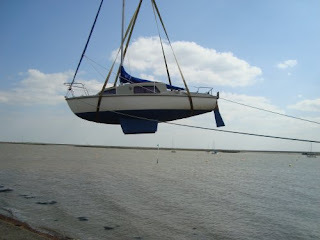 Proper sea anchor trials have yet to take place, but when Greg tried using his drogue (as distinct from his sea anchor) it had little effect, because the boat remained sideways to the oncoming seas. I suggested to him that his problems could be solved by installing two daggerboards, one near the bow and the other near the stern. 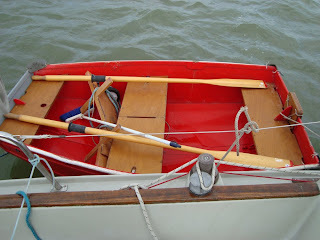 They would be similar to the ones fitted to Charlie Pitcher’s boat that he very successfully rowed across the Atlantic. 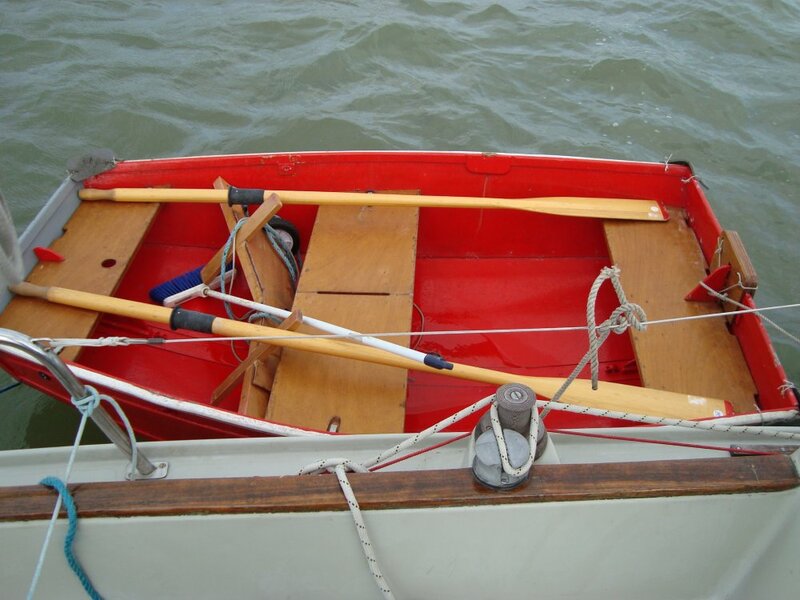 Effectively, they made his boat ‘sail’, and yet within the rules of the Woodvale Atlantic Rowing Race, because she did not have sails she remained a rowing boat. When rowing or drifting before the wind Charlie deployed the aft daggerboard and when his boat was sideways on to the wind he adjusted the depth of the daggerboards to suit the conditions and to help steer the boat. Greg is a pretty determined man, but he is also cautious, and I feel sure he will not undertake his record attempt unless he is convinced he’ll be able to do it without undue risk to his life. Being a belt and braces person, he will have a safety yacht at hand for the entire voyage. 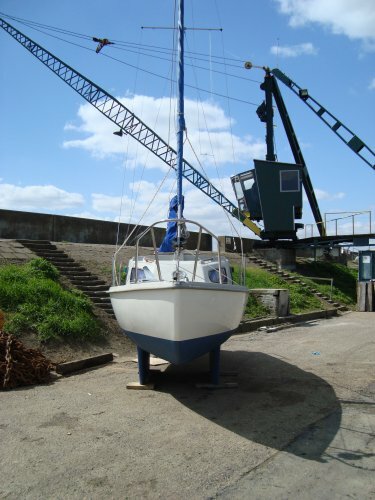 Before you read this article, please click the link to see a photo of ‘Windvinder’. It’s all in the mind. What’s in the mind? For me, the answer is ‘Reality’. My dictionary defines reality as, the state of things as they actually exist, as opposed to an idealistic or notional idea of them. I can only know and understand reality through the avenue of my mind, via my senses, but there is another reality, that which is constructed in my mind and equates to reality. Imagination, fact and fiction intertwine, producing an intangible world of reality, which is just as real as anything I can touch, smell, see, taste or hear. You’ll note that at the head of this Blog, my pseudonym is ‘Mind Drifter’, which is the most appropriate description I can find for myself. The name is fitting for a person who dreams small boats, thinks small boats, plays with small boats, builds small boats, loves small boats, because small boats are nothing more than minute plankton on a vast ocean, swirled around by currents blown by the winds, whose origin is in the sun. Small boats are drifters, just like me. When I read a recent Blog* I came across a link to ‘Windvinder’ where I found plankton that moved against the flow. This eureka moment was like discovering a kindred spirit who challenged and overcame invincible nature. I discovered a delicate marine creature, beautifully crafted in curved wood, embalmed in waterproofed fabric. 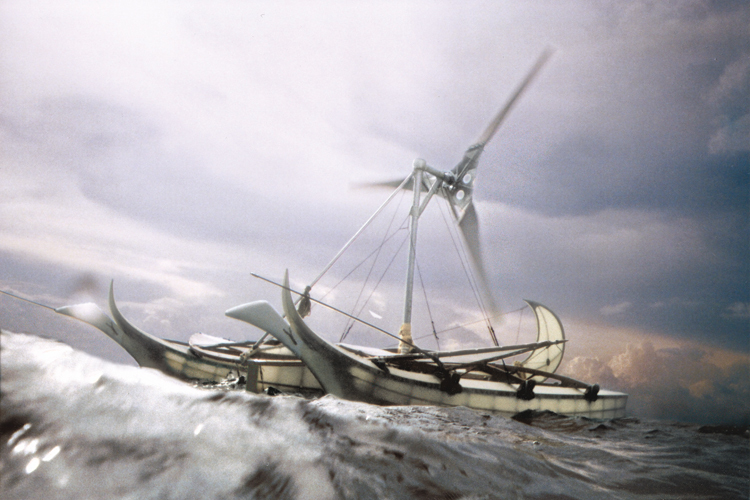 ‘His’ name was ‘Windvinder’, and his creator and maker was Wipke Iwersen, a talented artist born as a nymph of the sea with salt water running through her veins, driven by the heartbeat of pulsing waves. Truly, she is real. She is not a product of my imagination, and what she has produced is a real masterpiece, a living mobile, interacting and reacting to wind and waves. Mostly the sun, moon and stars are aware of his presence as he whirls his wings in defiance against the wind, but now and again he is seen by fishermen, islanders, porpoises and phantom albatrosses of the Great Pacific Ocean. His quest is to find the origin of the wind, and to that end, he always battles his way forwards directly into the invisible force. Sadly, his wings, though subtle and respondent, do not generate power; they simply absorb and dissipate energy, sufficient for making progress on the surface of the sea. Unless he can dream reality and fly to the sun, he’ll never find his heart’s desire. Is this really a pearl worth selling everything for? My subject today is ‘revelation’ which always means the revealing of something previously unknown. The Divine Revelation is the Apocalypse, the last book of the Bible about the End Times, which describes the destruction of the world and the supremacy of Christ over Satan, but here I’m referring to something far less dramatic, the revealing of self. We all reveal ourselves, by the words we use, the actions we take, the choices we make, our body language, and in all manner of ways. Writers of Blogs are into revealing their own characters, their passions, their loves and the things they hate. When you find a book with an interesting cover, you want to look inside to discover more. The first few pages will determine if your initial curiosity was justified and if your appetite was satisfied by the opening words, you’ll continue to delve further into a progressive revelation. That’s a bit like delving into Blogs. The followers of Blogs learn not only about subjects and topics, but about their writers. I’ve been posting articles to my Blog for more than five years, and every one of them has revealed a little bit about me. Frightening, isn’t it? Give the information to a psychologist who has been trained to analyse the minds of people, their motivations, their wants, their needs, their desires, their understanding of reality, their beliefs, there delusions, their misconceptions, what motivates them and innumerable other aspects of the mind, the expert practitioner will come up with a profile which may determine a need for remedial action. Well, that could be the case for me! One thing that will be evident is that I’m madly passionate about small sailing boats, so much so that there is hardly a day goes by that I do not think about them. I sometimes wish I could be as passionate about the things I ‘ought’. That is a shortfall of my character. I seem helpless to escape what appears to be an obsession, but how pleasant the knowledge is! Sin can feel a bit like that, but the reality of sin is deliberate disobedience to God, and who has not sinned? Sin for those who commit it, can be decidedly sweet, but there is a price to pay! The Bible, God’s word, tells us that all have fallen short of Godliness, for we have all sinned. The wages of sin is death - not just physical death, but spiritual death, a separation from God. Ought I to not be more passionate about God than small sailing boats? Here is an example of the complexity of Internet copyright. This photo was taken by Al Law, who has given me permission to use it on my Blog, but if you visit the Google Co. UK’s search engine and insert the words, ‘paradox sailboat’, you’ll see the same image with a caption stating the photo may be subject to copyright, which may be quite true. How do you know, unless you see it coupled with a copyright caption? What if Al had included it on his web site under his copyright? In fact, he has not – see link below - neither does his website have a copyright caption, but that does not mean the photo is not his copyright. If he were to place the photo in the Public Domain without copyrighting it, I believe I’m right in saying he would loose his exclusive rights. Because the photo is available at my Blog without a copyright caption, does this mean he has lost his copyright? I’m no lawyer, so please accept that what I’m setting out here is a personal interpretation of how I understand the copyright law regarding websites. 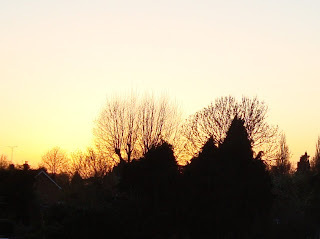 Since I started this Blog on Wednesday, 16th February, 2005 I have received only two requests to remove photos that apparently infringed copyright. The most recent request gave me the incentive to research the subject, which is an area that could test the mind and knowledge of eminent lawyers. The law of the global Internet is a place where angels fear to tread and the devil has much freedom to cause havoc. The subject is vast, and there are aspects that are far from clear. Even countries have their own rules and regulations; hence the current battle between the Chinese authorities and Google with regard to censorship. Let me say here, that if I have infringed the copyright of any material displayed at my Blog, I apologise to the grieved party. I will gladly remove such material. In most instances I add a link to sources from where I obtain information, images etc., which can only be good for the owners of those web sites. Bills-log is not a commercial website; indeed the regulations of Blogspot stipulate that wholesale commercialisation is not permitted, but reasonable use of Blogspot for limited financial gain is acceptable, such as the inclusion of a number of advertisements, say for the sale of books that may be available at Amazon. Jens Kuhn’s excellent Blog, Twin Keeler, includes an advert in the right-hand column of his Homepage for his book, ‘Gunboat Number 14’. The Blog of Thomas Armstrong,70.8%, contains 48 advertisements for books that can be purchased at Amazon.com. Incidentally, Thomas’s Blog is a cut above the average, and well worth earmarking as a favourite. In the past I have built and maintained several websites; some of their content was copied and used at other sites, despite the fact that my pages displayed copyright status. Basically, for small-time players, copyright means very little, unless a company, group or an individual hugely profits from an infringement, but actually enforcing redress is a different matter and it can be so costly that it makes the exercise beyond the reach of most individuals. Please feel free to copy and use whatever you like from my Blog, providing it is for your personal use on your own computer(s), and without financial gain to yourself or to others. I accept that a few people do not operate within such gentlemen’s agreements, and for them all is fair in love and war. If you are that person with no conscience, there’s very little I can do to prevent you misusing my material, but I would like you to know that I do not accept responsibility for any adverse repercussions because of your plagiarism. My wish is that you will enjoy what you read here and that you will make http://bills-log.blogspot.com a favourite; furthermore, that you may tell your friends. An early encounter; Checking her out! If you are like me, you build up a relationship with your boat. Strange, isn’t it? That’s because a boat, although nominally female, is actually neuter. It has no feelings or understanding, but the owner soon learns that ‘she’ has a personality, even a character. I know more about boats that sail than boats that are wholly reliant upon their engines, and that for me is a fine thing, because engines and I seldom get on. I do not know as much about them as I do sails, and therefore I do not know the best way to deal with them. They need care and maintenance, that’s for sure, but I understand the simplicity of sails and how they react to their driving force, the wind. Somehow, my boats have all been live creatures, and I’ve lost count of the number I’ve had. Details of our relationships have faded into the recesses of my mind, but one thing is for sure, I’ve never let them take total control of my life. I’ve always tried to manage them, which has been far better than letting them manage me. I’ve placed limitations on the length of my relationships with them, by always being the master, rather than the slave. What has intrigued me is how different they have been. 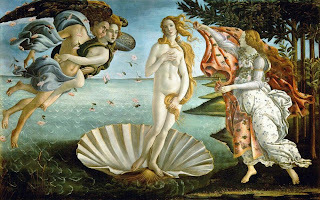 Some were tall and skinny; others were more average in proportion and one or two were rather fat and rotund, resembling the beauty of Ruben’s pearly maidens, rather than Botticelli’s more slender graces. No matter how functional, or how radical, all of my boats have been decidedly feminine. They knew how to charm, how to smile and how to beckon, even beguile, not in a deceptive sense, but as innocents blowing kisses, making laughter and giving affection. ‘Ladybird’ will be for sale in August, 2010, i.e., after my summer cruise to the West Country - that’s if all goes according to plan. 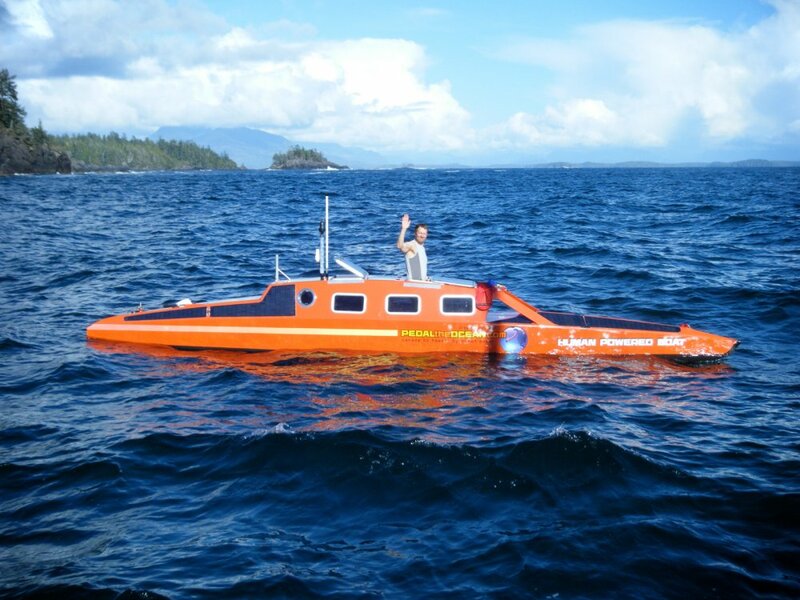 Some time ago I made mention of Alessandro di Benedetto who is attempting to sail around the world non-stop in a 6.5 metre boat. 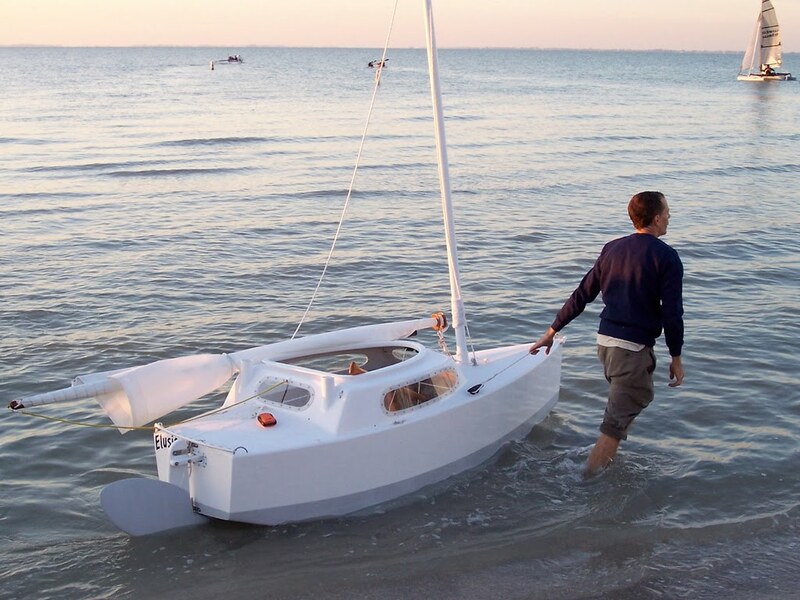 If he succeeds he will hold the record for sailing the smallest vessel non-stop around the Globe. 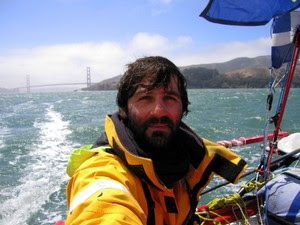 This 39 year old, Franco-Italian adventure sailor already holds two world sailing records: 1) He sailed single-handed across the Atlantic in a 20’ open catamaran, non-stop and unassisted. 2) Aboard the same vessel he crossed the Pacific Ocean by himself without stopping and without being assisted. These voyages were ratified by the WSSRC/ISAF. 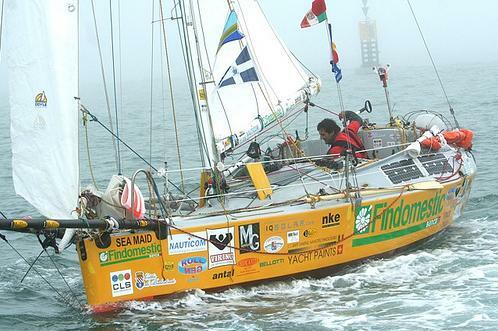 The Atlantic crossing was done in 2002 and the Pacific in 2006. I recently learned that Alessandro weathered a bad storm off the coast of Chile on Tuesday 30th March, but his boat was dismasted. 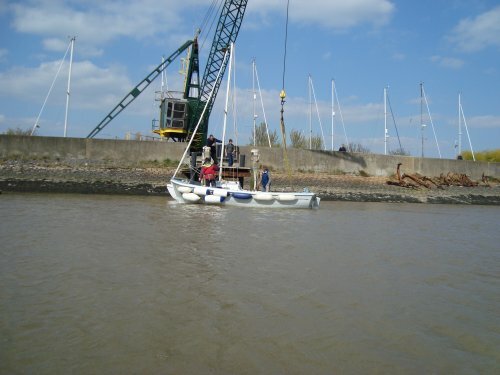 He erected a 20’ jury mast and got the boat sailing again. He decided to make for a Chilean port where he could replace or repair the damaged mast, but he changed his mind, preferring to continue south of Cape Horn before making northwards with the aim of returning to Sable d’Olonne, the starting point of his circumnavigation. 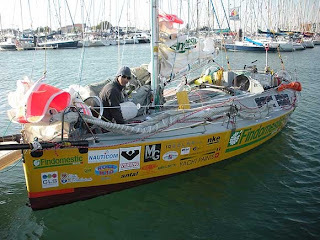 Alessandro left Sable d’Olonne on 26th October, 2009, which means he has been at sea for five-and-a- half months. 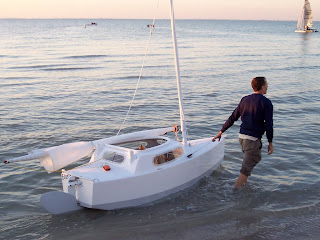 ‘Findomestic Banca’ capsized on 26th January, but this resourceful sailor had prepared for such an event by adding an aft cabin designed to right the boat. It was also a work station where he could shelter while steering his yacht. 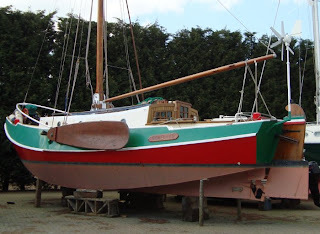 Originally she was a Mini 6.5 racing yacht designed for racing across the Atlantic. Alessandro thoroughly prepared her by reinforcing her hull with Kevlar and Carbon Fibre; he also strengthened her fixed bowsprit and fitted a steel rudder. He feels confident that his provisions will be adequate for him to complete his circumnavigation. Yesterday I rigged my Seawych sloop and set her sails on her spars. The mainsail is protected from the elements by a waterproof sail cover, and the furling Genoa has a UV strip along the leech. 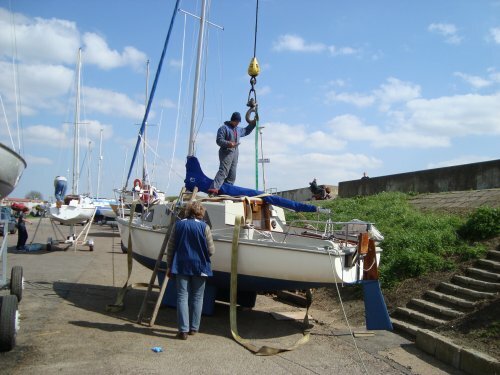 I renewed the Genoa sheets and changed the furling line for a thicker one. Last season the previous thinner furling line sometimes snagged around the drum when it became trapped between turns on the drum. Hope fully that will not happen with the thicker rope. Whenever the sail is furled or unfurled, tension needs to be kept on both the sheet and the furling line. The mainsail has roller reefing which is done by winding a removable handle in a mechanism at the forward end of the boom. Usually it is not necessary to reef the sail beyond the first batten, which would only be the case when the wind is stronger than force 5. Today I sanded the old antifouling and applied a coat of Flag cruiser antifouling. Two-and-a-half litres will cover 10 square metres, which is enough for me to apply a second coat. For the first time ever, I used a roller instead of a brush, and I was amazed at the smooth finish and speed of application. Flag is cheaper than competitors, but does a pretty good job at Burnham-on-Crouch. A 2.5 litre tin costs £29.50 from my local chandlers at Southend-on-Sea. 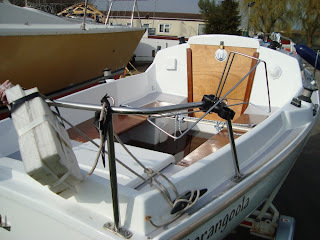 After doing the antifouling I varnished all the exterior woodwork. In yesterday’s Blog I mentioned that I was a little distressed because of something I would reveal today. Well, when I removed the winter covers I discovered a nest that had been built by a pair of robins. The birds had made their home between a cleat and the cockpit coaming. The carefully constructed cradle of woven grasses and leaves contained four off-white eggs with tiny rust-coloured speckling. There was nothing I could do, because the damage had been done. The birds had flown their nest, and only later did I become aware of their calls, but I could not see them. I wondered how long they would have looked after their brood. 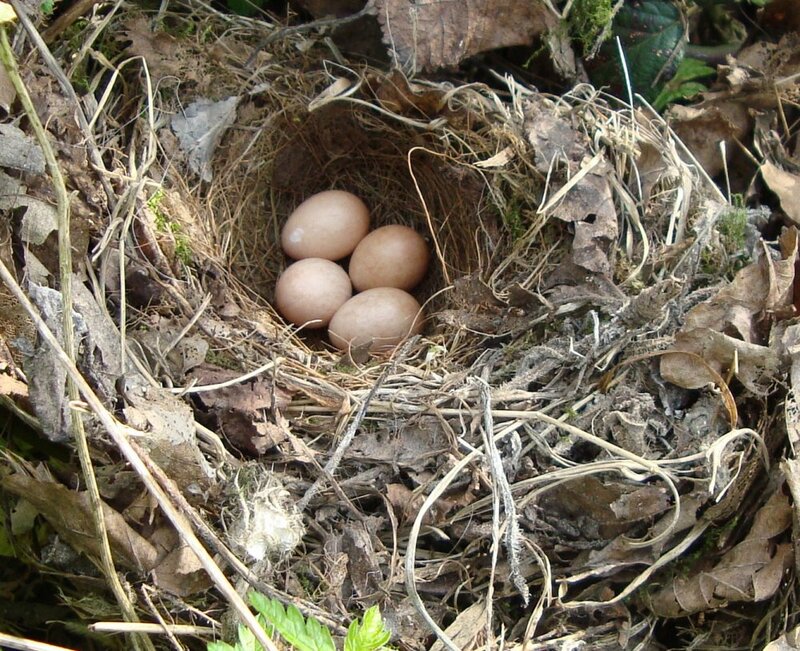 From one of my bird books I discovered that robins usually lay between five and eight eggs; therefore the female may have been in the process of laying her eggs when I rudely and unknowingly interrupted her. Robins lay their eggs between February and July, which makes me feel not so bad about the incident, because there’s time for them to try again. When she was being renovated. 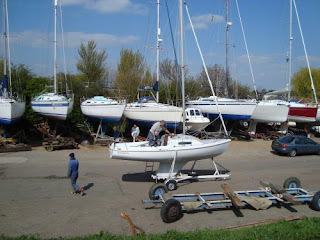 I found time today to take the covers off my Seawych 19 and to set up her rigging and her sails. More about this in tomorrow’s Blog and a slightly upsetting tale. Today’s yarn is also a little upsetting. I should not get involved in other people’s boats, but right near ‘Ladybird’ there’s ‘Barangoola’, a 36 year old, rebuilt Hunter 19. I mentioned her in a previous Blog about David Blagden and his Hunter 19, ‘Willing Griffin’. (See link below.) 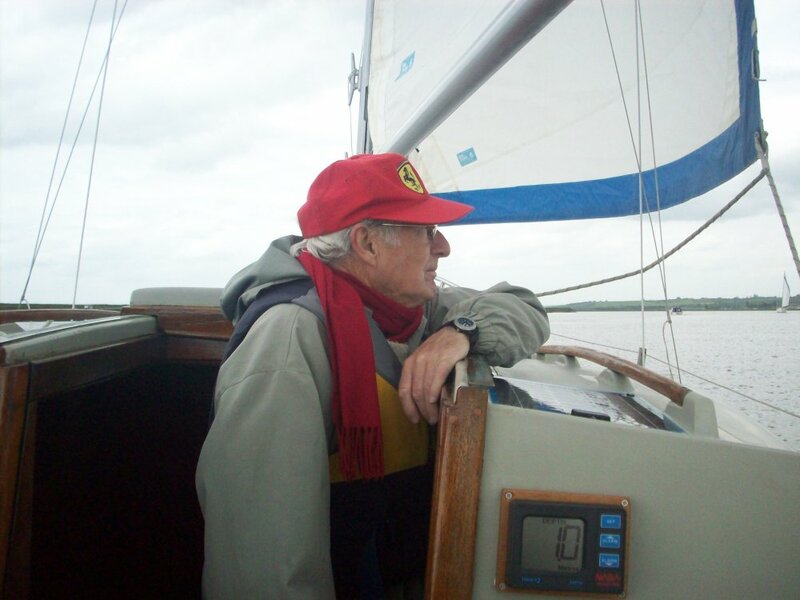 As you may know, David raced his little boat across the Atlantic in the 1972 Observer Single-Handed Race. 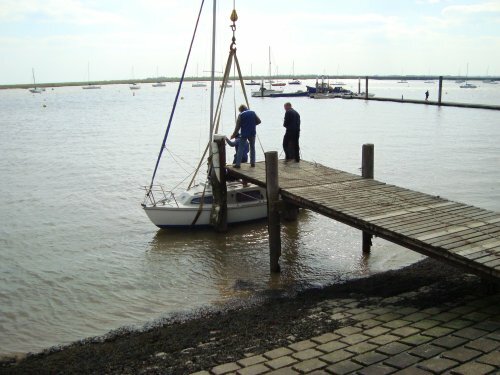 Well ‘Barangoola’ was renovated by volunteers to raise money for the RNLI Burnham-on-Crouch Floating Boathouse Appeal. She was on display at the London Boat Show where people could buy £5 raffle tickets in the hope that they may win her. The Marine Trades Association and numerous marine companies donated money and items to the value of £5,000 for her restoration, and volunteers worked jolly hard to bring about a top-notch finish to the boat. Altogether, £17,200 was raised as a result of all the effort put in by the people involved. 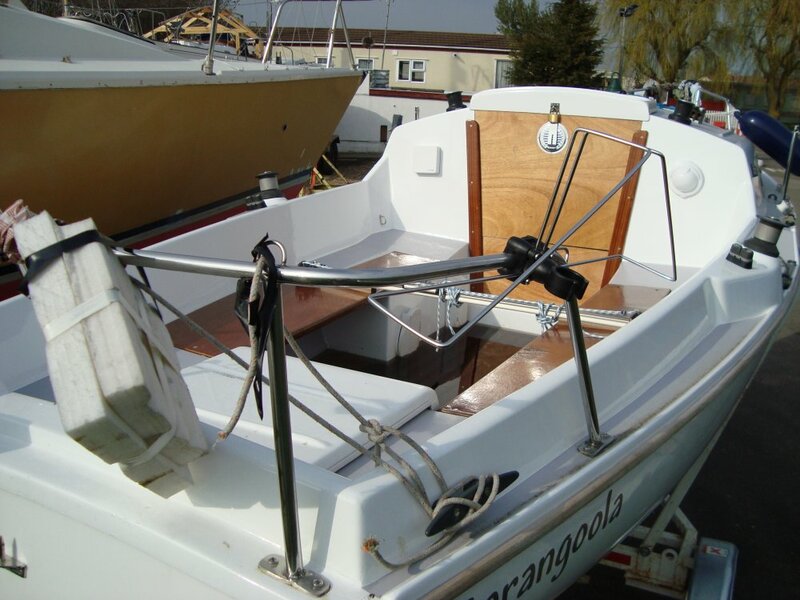 Some lucky person ended up being the owner of ‘Barangoola’, plus a trailer, a set of oilskins, lifejackets and up to £400 of RYA training. I never expected to see the boat again back at Burnham, but the sad thing is that whoever owns her, does not appear to be interested her. 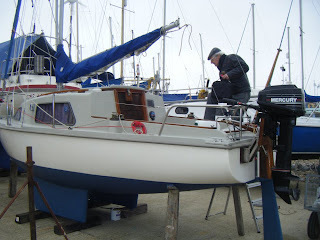 Today her cockpit was awash with rainwater, which was only inches from the companionway step. I certainly would not like to see the boat ruined by water entering the cabin, and I shall take the initiative of pumping the water out to prevent this happening. Giving the new owner the benefit of the doubt, it could be that he or she is unaware of the problem. I’m surprised the owner of the boatyard where she is stored has not done anything about it.